DISCOVERY Onboard food and beer pairing dinner hosted by your Beer Expert. DISCOVERY Enjoy an onboard beer lecture and tasting hosted by your Beer Expert while sailing to Amsterdam. DISCOVERY Explore the iconic waterways of Amsterdam with a Guided Canal Cruise past stately homes of Amsterdam’s “Golden Age.” followed by a real Dutch beer experience. 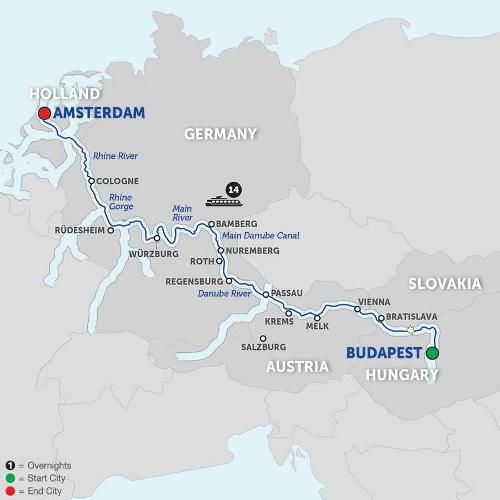 From Budapest to Amsterdam, you’ll be immersed in the culture of Central Europe, as well as its beer and brewery traditions, on this European river cruise vacation. In Budapest, Hungary; Bratislava, Slovakia; and Vienna, Austria, a Local Guide will show you the must-see sights in each city, and you’ll have plenty of time to explore on your own. See Heroes’ Square in Budapest, Bratislava’s Old Town with its winding streets, bronze sculptures and hidden microbreweries, and stop in a classic Viennese café for a decadent treat or to sample Austrian beers. Sail through the picturesque Wachau Valley and the dramatic Rhine Gorge. Visit Melk’s magnificent Benedictine Abbey and Würzburg’s baroque Bishop’s Residenz and enjoy a German beer tasting. You’ll explore Holland’s lively capital of Amsterdam to see the treasures of this 700-year-old city from the unique perspective of a canal cruise. Take the opportunity to taste delicious Dutch beers. A Beer Expert travels with you on this cruise and will hold lectures, tastings, and will introduce you to food and beer pairing as well. Prost!